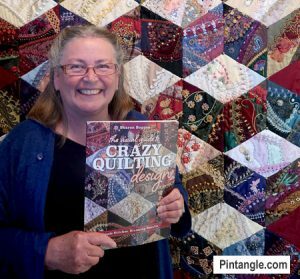 Please put on your imagination hats and then imagine me bounding into the room, with a big silly grin on my face waving my 2020 crazy quilt block 7 enthusiastically. It is great to be back home stitching, pulling out stuff for this challenge, making a mess and having fun. Yes, block 7 is now finished and bound. The aim of the 2020 challenge, is to make a crazy quilt using 2,020 different items to mark the year 2020. You will find the guidelines, information, and a list of free resources here. I figure this is a leisurely and enjoyable project, as I have a couple of years to complete it. The fun is in finding and using 2020 different items. This was my starting point for block 7. I have started to share my unembellished blocks, as many people who start out get worried over the look of the block before they start stitching. 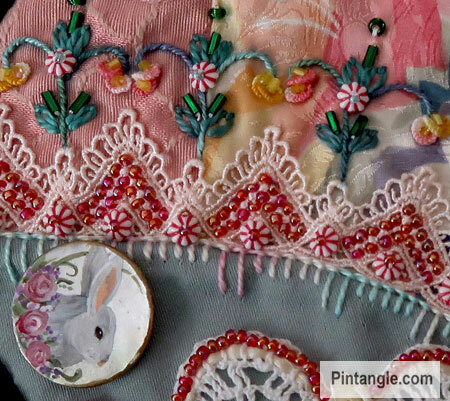 For me, it is often the embellishing that pulls a block together. I used 5 pieces of fabric and during the piecing process, I added the braid/trim, the lace and the cut doily. As usual, here is the basic pattern of my 2020 crazy quilt block 6, for those who want to use it. 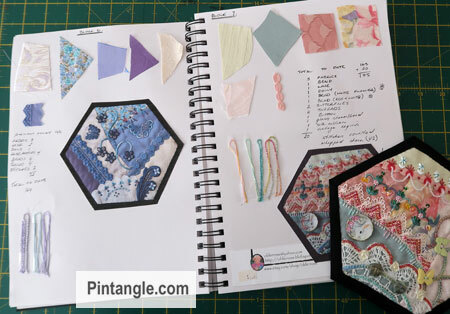 Before you ask, all my hexagons have 4-inch sides and measures 8 inches across from point-to-point but you can use this pattern for other sized hexagons too. The first photograph illustrates how I embellished the braid/trim with vintage sequins and bead scallops. Between the sequins, I placed a white vintage flower shaped novelty bead and I spaced a French Knot (counted on block 1) between the sequins. The next detail is a version of chain stitch (version two on this page in my stitch dictionary). First, I worked the foundation row in a hand dyed cotton #5 perle thread then whipped it with a Threadworx thread called Pastel Sunset (I am not affiliated or get any kickback just thought it’s such a pretty thread people would want to know what it is) The butterflies are a vintage plastic button! This section is a little complex. As you can see I beaded the lace. The strange alien flower motifs above the lace are made of Stem stitch (counted on block 1), Detached Chain Stitch (counted on block 1), both worked in a Caron watercolours thread (also not affiliated, nor do I gain financially). The little raised disk-shaped flowers are made of Cast on Stitch (counted on block 2) using one of my hand dyed cotton perle #8 threads. the little round disk-like daisy shape beads are plastic and pretty cheap as I found them in a discount store. When I shared on Facebook a work in progress shot of this block I was asked about how I was keeping track of the number of things I had used so that the count was not muddled. I keep a studio journal and here you can see the page. I have scraps of the fabric and a piece of the braid/trim used on the block, bits of thread taped in as stitched and the card that Gerry’s button was on. It has her website so if ever I want that information it is there. You can see I also print out a photo of the block and glue it in when it’s done and keep a running tally of what is what. Seed and bugle beads are not counted. Beads and sequins 4: vintage white flowers beads, round disk-shaped flower beads, pale glass face beads, vintage sequins. Threads: 5 hand-dyed cotton perle #5, hand-dyed cotton perle #8, Threadworx Pastel Sunset, Caron Watercolour, pale yellow silk ribbon. 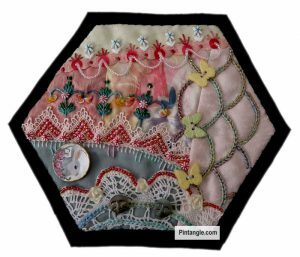 2020 crazy quilt block 7 bring the total of items used to date to 185! Great! I’ll be looking forward to hearing whatever you share! buttons and beads and butterflies – OH MY! amazing work as always. thank you for sharing and inspiring. I love this block. Love the colors, the alien flowers, and . . . well,. . .just everything about it. I’m hoping to still participate in the challenge. I did a bit of designing, but that’s as far as I’ve gotten. I also have quite a few UFOs/WIPs to work on. One of which, I def should put first before anything else. My curiosity was piqued by a poster’s question about your Camino experience(s)? If it is something personal, please don’t feel you need to answer. I’m just naturally nosey, and I always liked Caminos (the cars). Have a great Labor Day weekend! In-Joy! I will share a bit more about it probably next week. Since you are the second person to ask! Amazing. 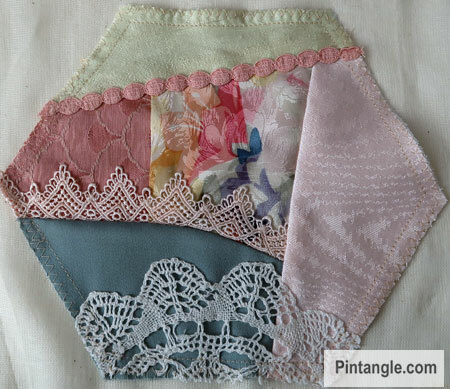 I love quilting and other handicrafts like laces. Happy weekend. Amazing. I love quilting and other handicrafts lice laces. Happy weekend. Totally awesome, Sharon! Showing the layering process is such a good teaching tool. I also love the studio journal you keep. Hi, I want to known if I can print this pattern nr. 7 and all the other patterns before? Also the same for the explanations. I like to make this crazy quilts at my time and speed, because for the moment I have a lot of other things to finish first. Sorry for my English but I speak Dutch. Thanks for sharing your process, I can see the use of your wonderful templates in some of the stitched lines. The block is beautiful. I too love Gerry’s buttons, I have a chipmunk, pansy, and goldfinch of her delightful work. Hi Sharon – I think things changed a little after the last camino – but I don’t think my blocks have changed- I decided to sketch more and at the moment I playing with a few new ideas – a sort of improv quilt with embroidery – but it’s at the exploring stage. I have dozens of photos that could be used for embroidery designs and some ideas for new stuff here but its all still percolating around. I probably could write a ‘have a cuppa post’ about it but I will do it when the ideas have formulated into something more solid. Otherwise is all sounds like waffle. Your work is amazing and your attention to detail leaves me speechless (and that means heaps if I’m speechless ). No wonder you are such a successful author. See you soon. Well done, Sharon. My quilt has been put on hold temporarily while I make items for the Northam Show. I’m putting in 13 things – all sewn, knitted or crocheted. The show is 7-8th Sept, then I can get back to block 4. I’m loving “finding” trims and laces and trinkets that I swear I have never seen before although obviously I have because it was me who put them away in boxes in the first place. Glad you are able to get back into your cq again and yes, I can well imagine you bouncing around the room with a silly grin on your face, lol. HI Viv – yes its amazing what you can find in the corners of boxes and how a 3 inch piece of stuff can suddenly become so important! Thank you so much for sharing, so inspirational, makes me want to get busy to something! Oh rats! I had forgot about the challenge! I need to get back to work on it. Lovely block by the way. Love the rabbit button.